Can I build a rink over my in-ground pool? It would be amazing to transform a swimming pool area into a winter skating arena. The pool area of a home is ideal for entertaining. Power and lighting are in place and, in some pool areas, Jacuzzi’s and fire pits are already being used during the winter months. How cool would it be to now have a winter ice rink for hockey and skating in the very spot where you swim and sunbathe in the summer months? A rink in the pool area is a great idea for having a family fun time during the winter but there are several things to consider before you commit to this possibility. The most favorable scenario for building a rink above the pool is when the in-ground pool is surrounded by healthy concrete. Most in-ground pools have a nice patio surrounding so they are well suited for this project. If your pool is surrounded by pavers, it likely can also be done but extra care will be required to spread the base load. 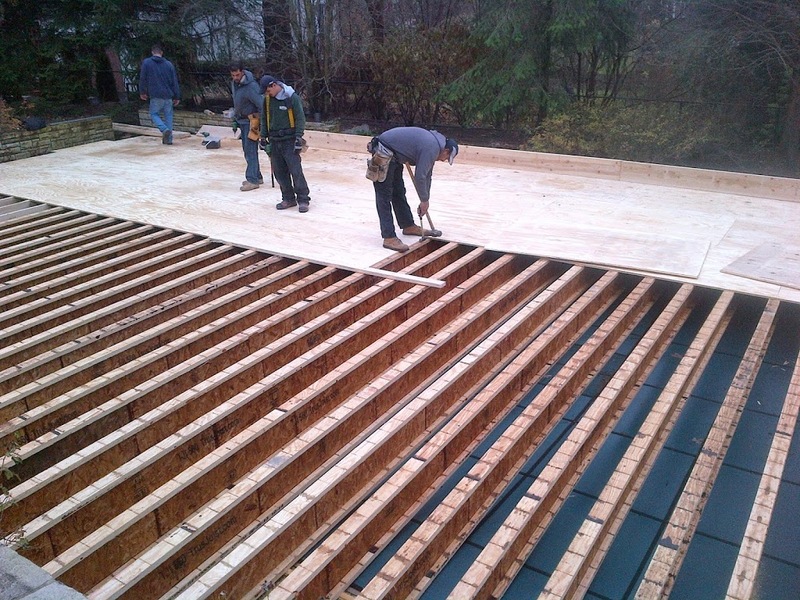 In essence, what you will be doing is building a shallow pool above a pool (rink over in-ground pool). The in-ground pool should be covered and closed just as it would be for a regular end of season winter. A stage with trusses spanning the entire width of the pool should rest on the patio and be slightly raised above the pool. 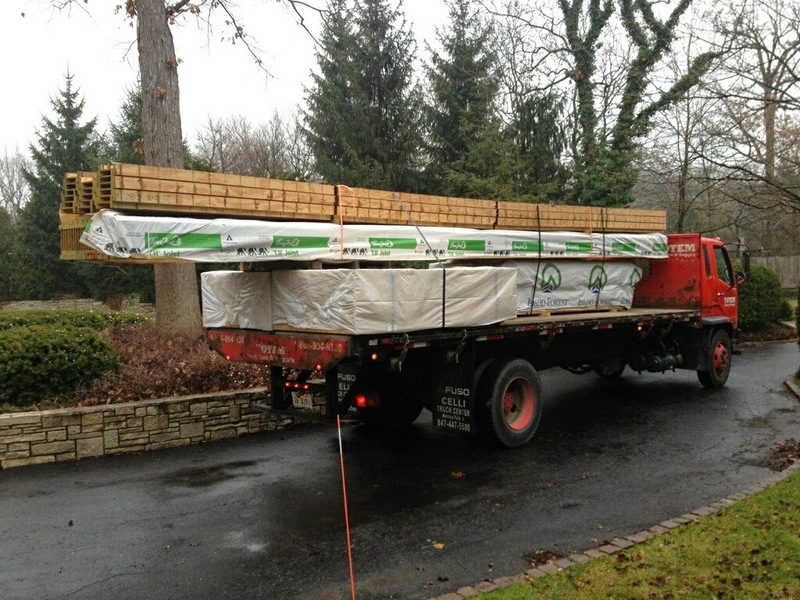 Raising the stage is critical as it spreads out the base load and helps to level the platform if needed. THIS METHOD LEAVES YOUR POOL UNTOUCHED. The platform should be level within 2 inches to keep the water load at a minimum. Then, side walls are put up around the stage to form a rink enclosure. Finally, a one piece ice rink liner will cover the entire enclosure. Now with the rink filled, patiently wait for the freeze. 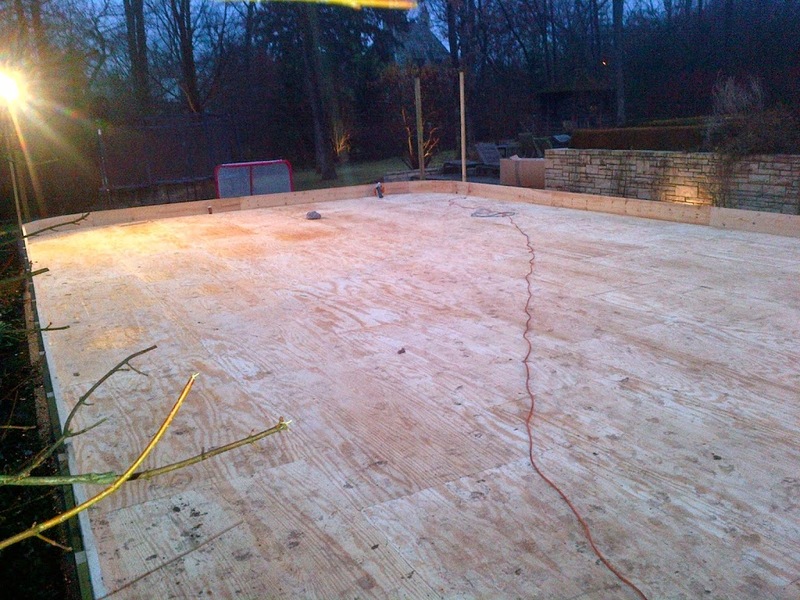 All the same rules to building a backyard rink apply once the stage and enclosure are built. If you want to make the rink gorgeous, consider using rink topper, rink rounds, and board wrap. Rink enclosure above pool ready for fill up! The stage should be engineered by an architect or engineer. Do not just wing this and do not do it yourself! It would be a DIY undertaking nightmare. 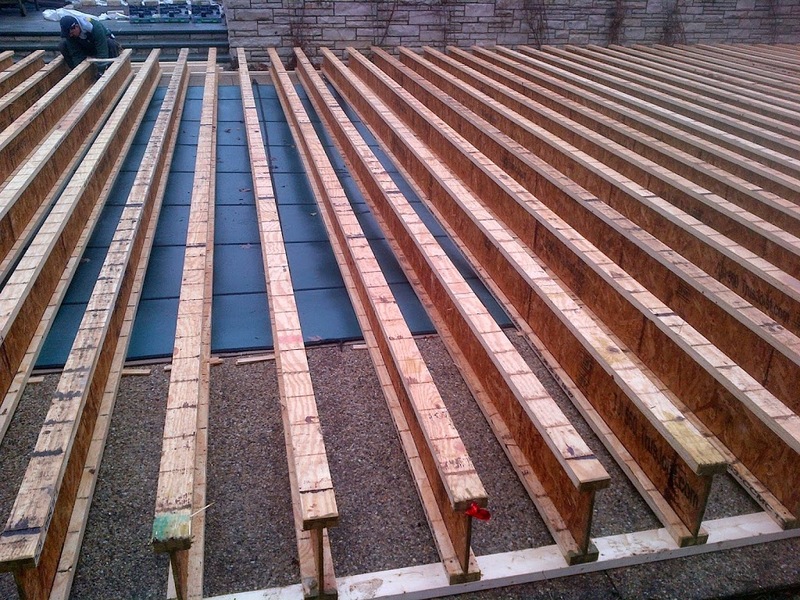 The architect should design a deck that could support the load of the lumber, ice, and multiple skaters while being solid enough to minimize ice cracks. The balance here is to keep stage profile low while keeping engineering specs and material cost in check. If the stage is not solid, the bouncing will encourage the ice to shatter. The dynamic and static load should be several times better than that of you own home. Do not use basic 2 by lumber for truss as they are not stiff enough, use engineered trusses. The truss manufacturers should be able to help your contractor determine the truss size and spacing for the application. For the stage platform floor, it is recommended to use ¾ plywood with a tongue and groove. Be sure that the stage base is well distributed along the concrete patio. Also, be sure the stage is built in a way that makes it easy to disassembly. When the stage is torn down for the season, dispose or recycle the liner and store the stage material indoors. This is just a guideline from our experience in building rinks above pools in Chicagoland. Building materials are $5.00 per square foot. Labor comes out to $2.50 per square foot. So for a 25 by 50 rink the cost would be $6,250.00 in materials and $3,120 in labor. The labor effort is 4 skilled carpenters for nearly 2 days to assemble and just 1 day to disassemble. Storage would cost about $1000/yr. 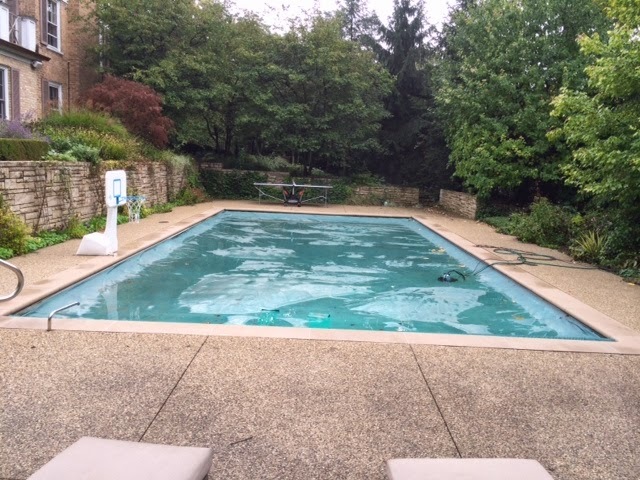 It seems like a lot of money up front but it is just a fractional investment compared to the pool while it repurposes your awesome pool area for the winter. The material investment is mainly a one-time investment and the reoccurring cost of set up should be less the 2ndyear than it was the first year because all of the wood cuts and field decisions will have been already completed. 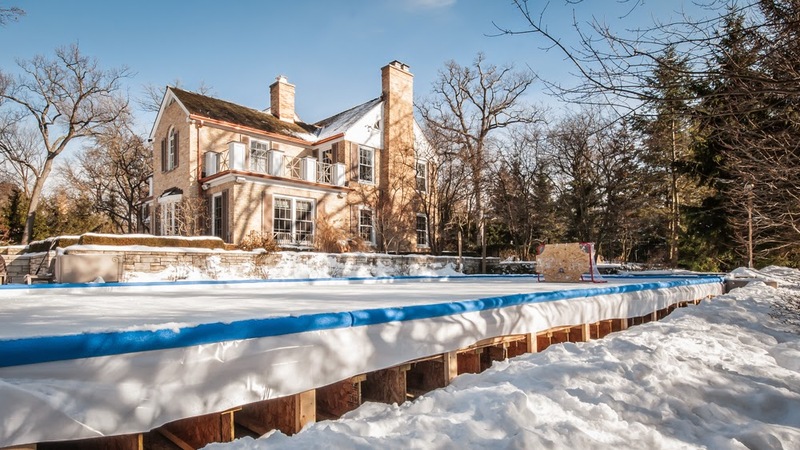 A rink above a pool is a great investment in family fun that transforms your pool area to a winter wonderland. Stage is built, ready to become a rink!! You will have better ice because the rink is above the pool as opposed to being on the warm pitched earth surface. Here is how this works. 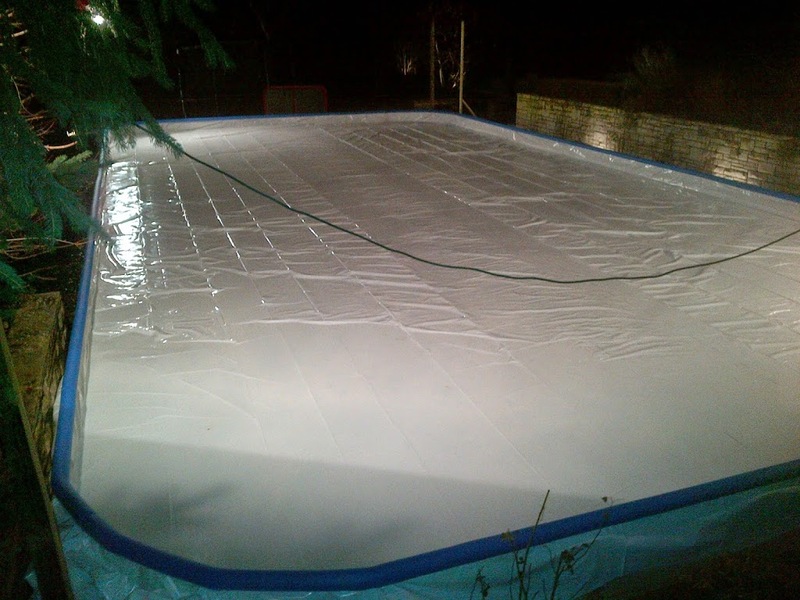 The pool cover will act as a vapor barrier and will keep the warmer water from underneath from heating the ice rink. The rink will actually freeze from both the top surface and the bottom because the ambient cold air will attack the rink water from both above the rink and below it. On a basic rink built on lawn, the earth actually warms the water. Freezing water on a rink built on lawn is a tug of war between the earth’s warm ground surface trying to heat the water and the cold ambient air working to freeze it. 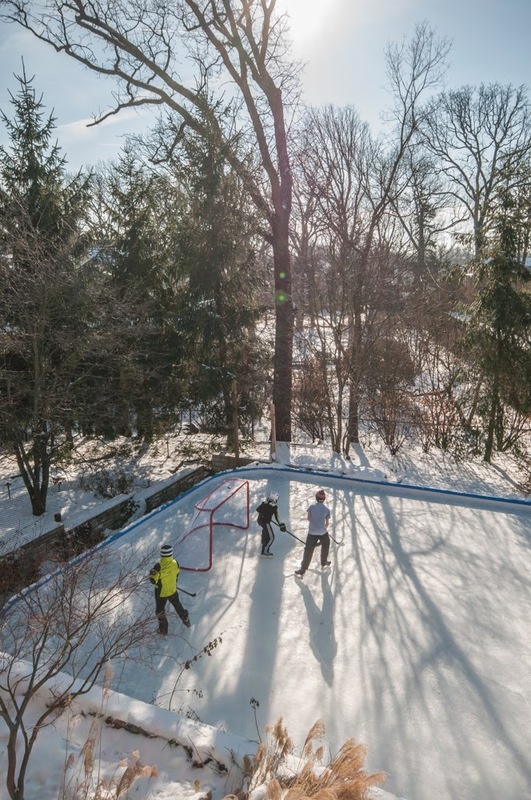 With a rink above a pool, this tug of war of freezing does not exist. We have all seen the street signage “Watch for Ice under Bridge”. That same concept applies…it is colder under the rink because it is shaded. Another consideration for better ice is that the platform will be level. A rink built on grass has to negotiate several inches of ground pitch. The ground pitch causes temperature gradients in the ice that cause cracking. With the rink above the pool, temperature gradients will be minimal and it will also be likely that the rink water will freeze 100% throughout. Seldom does a typical backyard rink freeze 100% across. Conclusion, ice quality is better on a rink above a pool. Pristine ice above the Pool!! -A rink above a pool is a luxurious expensive solution for an ice rink. This is an option for families that can afford the more elaborate solution. -This is a solution for families whose yards space is taken up by the pool. -If your yard is severely sloped and the only flat area you have is the pool area, you may want to price this out. -A good solution for those who do not want to disturb their landscaping. -A rink on a stage is usually level enough to convert to a refrigerated rink. If you want to extend your skating season from Thanksgiving to St. Patrick’s day, consider installing refrigeration. Refrigeration for a 30 by 50 rink starts at 50k plus extras. -The stage can be used as a sports court so you can enjoy it for roller hockey, basketball, paddle, or pickleball before the winter season hits and it gets converted to a backyard hockey rink. -The stage is not a complete sunk cost. It should have resale value to a local ice rink installer. Refrigerated rink are often build on platforms. Next Next post: What should I use as RINK BOARDS for my Backyard Skating Rink? ?